Cascade Centers: Are You Stressed Out or Burned Out? How to Avoid Career Burnout. Are You Stressed Out or Burned Out? How to Avoid Career Burnout. 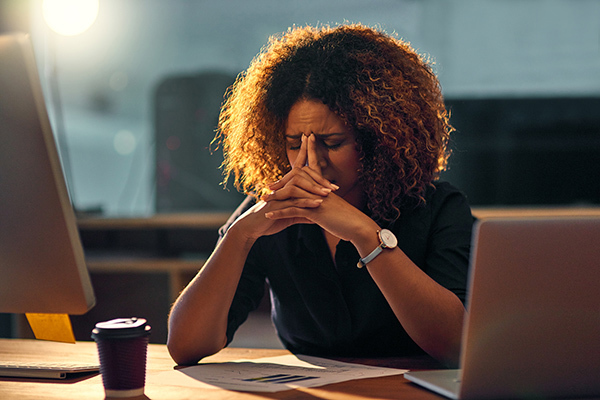 Many of us have been there: a stressful workday turns into a hectic month, which turns into a rough year, which turns into physical and mental exhaustion. But how can you tell if you’re just stressed, or if you’ve reached total career burnout? According to Beth Genly, lead of the coaching and consulting company Burnout Solutions and coauthor of Save Yourself from Burnout: A System to Get Your Life Back, there are common signs for stress that has moved beyond the day-to-day. When we watch for those signs and practice proactive self-care, we can prevent burnout altogether. Genly, a former nurse, says her idea for the book came from her own experience. She’s gone through career burnout three times, and though the fields she was in and the causes of her burnout were very different, she says she was still similarly miserable every time. Burnout is common in helping professions like health care. But studies show that it turns up across industries, no matter the intrinsic stress level of the job. All kinds of people, “from hotel managers, to finance people, to grocery checkers,” experience burnout, she says. In the book, Genly and her coauthor, Dr. Marnie Loomis, compare burnout to a repetitive use injury. It gets worse over time, and when you don’t have the tools to deal with it, you get more and more miserable. Fatigue, she says, is the most common and most recognizable symptom, but many of us don’t notice it until it reaches a breaking point. The difficulty, then, comes with determining the difference between a stressful day and full-on burnout. “With burnout,” Genly says, “you reach the point where you feel so tired, it feels like bone-deep weariness. You stop being able to connect with other people very well, and you start wondering if there’s any point to what you do.” Other warning signs include frequent crankiness and isolation, especially from people who don’t normally keep to themselves. The first thing to do with your complete burnout shield, Genly says, is identify what you’re doing well. “Give yourself credit first,” she says. Beyond that, you should explore areas that are lacking, determine why they are behind, and find ways to fix them. For example, if you’re lacking in community, find a way to go out with friends regularly. Build it into your schedule. Prioritize it so it doesn’t fall off your to-do list. When it comes to self-care, Genly says sleep is of the utmost importance. “There has to be a very conscious commitment to getting enough sleep and rearranging your life so that sleep becomes a priority. When you do that, you become a much nicer, much smarter human being.” Research has shown that every day we lose sleep—even when we get just a couple hours less than we need—our cognitive functioning slows. But we can’t often tell that we’ve slowed down, because our brains try to protect us from recognizing our shortcomings. We tell ourselves (and others!) that we’re doing just fine with little sleep, and though we believe it, it’s likely not true. Genly’s wake-up call was a middle-of-the-night car accident after a long nursing shift. After that, she knew something had to change. Managing blood sugar is another important aspect of self-care. “People who are go-getters, who are really pushing themselves, tend to eat irregularly,” Genly says. “They work straight through mealtimes.” But when our blood sugar drops, and when we’re dehydrated, our cognition slows, and just like with a lack of sleep, we’re more likely to make mistakes. It’s not just a matter of eating regularly, though. The type of food is important, too. “Challenge yourself to eat fruits and veggies at every meal and every snack,” Genly says. “It’s not always possible to do. But every time you can, you’re doing your body a favor.” To help yourself along, she recommends stocking plenty of fruits and vegetables along with high-fiber, high-protein snacks to grab when you need them. That will keep you from reaching for sugary foods that will give you a boost for a moment but will cause you to crash soon after. Ultimately, avoiding burnout is about being intentional with ourselves. Even if we choose high-stress professions, Genly says, we can still keep ourselves functional and happy. Brandon LawsBrandon Laws is the Director of Marketing at Xenium HR and the host of the Human Resources for Small Business podcast. He provides strategy and oversight on Xenium’s brand, all marketing campaigns, digital marketing strategy, and events. He’s also active throughout the HR community; he currently volunteers at the Portland Human Resource Management Association.